Welcome to MirrorLessons’ privacy notice, which incorporates our sister websites Mirrorless Comparison, Mirrorless Curation and Instant Camera Blog (collectively referred to as ‘MirrorLessons’). This notice applies to all of these websites unless otherwise specified. Click here to find out more about our websites. MirrorLessons respects your privacy and is committed to protecting your personal data. This privacy notice will inform you as to how we look after your personal data when you visit our website (regardless of where you visit it from) and tell you about your privacy rights and how the law protects you. 3 3. How is your personal data collected? This privacy notice aims to give you information on how MirrorLessons collects and processes your personal data through your use of this website, including any data you may provide through this website when you sign up to our newsletter or take part in a competition. 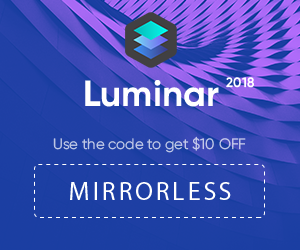 MirrorLessons is the controller and responsible for your personal data (collectively referred to as “MirrorLessons”, “we”, “us” or “our” in this privacy notice). This version was last updated on 5th November 2018. Technical Data includes internet protocol (IP) address (note, IP addresses are anonymised in Google Analytics meaning they end in an 0, so we do not see the precise address), browser type and version, time zone setting and location, browser plug-in types and versions, operating system and platform and other technology on the devices you use to access this website. Where we need to collect personal data by law, or if we need to under the terms of a contract we have with you in future, and you fail to provide that data when requested, we may not be able to perform the contract we have or are trying to enter into with you (for example, to provide you with any future services). In this case, we may have to cancel a service you have with us but we will notify you if this is the case at the time. Technical Data from newsletter providers such as Mailchimp based outside the EU. Click here to find out more about the types of lawful bases that we will rely on to process your personal data. Our websites engage in affiliate marketing, which means embedding tracking links are placed into our websites and if you click on an affiliate link, a cookie will be placed on your browser to track any sales for purposes of commission we receive. For mirrorlesscomparison.com, we are participants in the following affiliate programs: B&H Photo, eBay Partner Network, Skylum (Impact Radius), MPB US (Awin), MPB (Awin), Mediterranean Photo Tours and The Inspired Eye. We are also a participant in the Amazon Services LLC Associates Program and Amazon EU Associates Programme, which enable us to earn advertising fees and links to Amazon.com and Amazon.co.uk. As such, our websites post customized links, supplied by Amazon, in order to track referrals to their website and Amazon use tracking cookies, to track any sales for the purposes of assigning commission. We will get your express opt-in consent before we share your personal data with any company outside the MirrorLessons group of companies for marketing purposes. In order to proceed to use our website, we do require your consent over your cookie settings in respect of our advertising cookies. In particular, we require you to opt in or opt out of the advertising cookies that we use. We may have to share your personal data with the parties set out below for the purposes set out in the list in paragraph 4 above. We do not ordinarily transfer your personal data outside the European Economic Area (EEA). Service providers acting as processors based within the UK, EEA or US who provide IT and system administration services. Professional advisers including lawyers, bankers, auditors and insurers based within the UK who provide consultancy, banking, legal and insurance. Mailchimp, based within the US who provide the newsletter platform. Disqus, based in the US, who provide the commenting platform. Mediavine, based in US, who provide our advert management services. Affiliates including Amazon, eBay, B&H Photo, etc. based either in the EEA or the US.